The Philippine Red Cross remains committed to help critical locations under Manila Water’s concession area that are hardest hit by the water supply shortage. Philippine Red Cross is one of organizations in the frontline which led the delivery of water to affected hospitals within Manila Water’s service area. 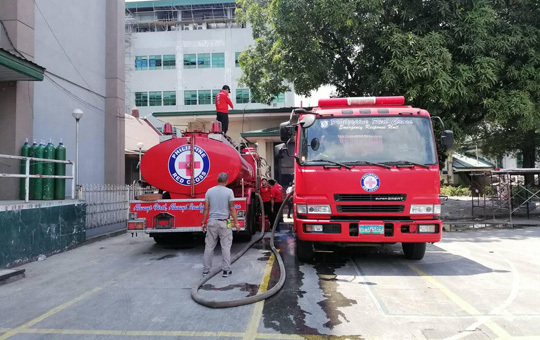 Since March 13, PRC has dispatched eight of its 20 water tankers capable of filling up a high-pressure water system to different hospitals to ensure there will be no interruption in delivering healthcare services, minimize the risk of infection, and maintain good hygiene in all affected public health sectors. “We are ready to address the needs of the hospitals because we have water tankers that are capable of filling up a high-pressure water system,” said PRC chairman and Senator Richard Gordon. PRC reported that as of March 19, they were able to deliver and distribute more than one million liters of water to Rizal Medical Center, Quirino Memorial Medical Center, National Kidney and Transplant Institute, East Avenue Medical Center, Mandaluyong City Medical Center, and National Center for Mental Health. PRC was also able to deploy water tankers to the Philippine Health Office, supplying 12,000 liters of water. The organization has also stretched its help to affected residents in barangay Old Balara and Culiat in Quezon City, barangay Highway Hills in Mandaluyong, and barangays Tumana and Nangka in Marikina. Gordon said he has ordered PRC men to continuously assist affected hospitals, making sure they have enough water supply. To date, their water tankering initiatives have benefitted more than 40,000 people from various areas. Manila Water President and CEO Ferdinand Dela Cruz thanked PRC and Gordon for their unwavering support and help through their continuous delivery of water to affected hospitals and communities.